King's Cross reimagined by Eden Grey. 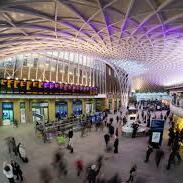 "My inspiration was imagining Kings Cross station as though it were a science fiction setting. Being such a busy station, I was thinking of it in slow motion. I time stretched and pitched down some parts of the recording, in so slowing down the bag pipe player. I added recordings of my modular synthesizer to further create the sci-fi theme."